Dale Miller is an animal science graduate of the University of Minnesota, and he joined the National Hog Farmer editorial staff in 1973. Throughout his career, he has traveled to most states and many foreign countries to study and report on pork production practices. Miller’s writing and photography have won numerous awards, including the American Association of Agricultural Editors’ Master Writer award in 2006. He has been recognized with the Honorary Master Pork Producer award by the Iowa Pork Producers Association, the Minnesota Swine Honor Roll, the National Swine Improvement Federation Distinguished Service Award, and in 2013 he was presented with The National Association of Swine Records’ Lifetime Achievement Award. Dale remains active in pork production by raising purebred Chester White breeding stock, F-1 gilts and premium locker pork. 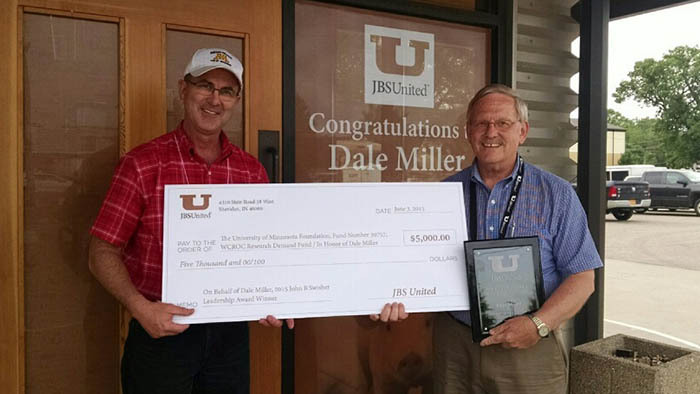 As part of the honor, United Animal Health has awarded a $5,000 scholarship to the University of Minnesota, Miller’s alma mater.